Look at how bare the floor looked! Silly me didn't realize what it would look like when all that stuff came down! It looks like this! Getting everything down took forever! I didn't realize how much I had stuffed up there. And all by myself! Getting it down wasn't near as easy as putting it up there! On a more positive note, I placed my bookshelves. I really think I need black book shelves, don't y'all?? Above the bookshelves will be my evidence board. You can see last year's here and grab a free copy of the evidence term posters here. :) The VIP Area is moving, so the door will need to be recovered as well. I'm planning on creating my Word Nerd vocabulary board on that blank space between the window and the corner. I'll be posting more about Word Nerds soon! 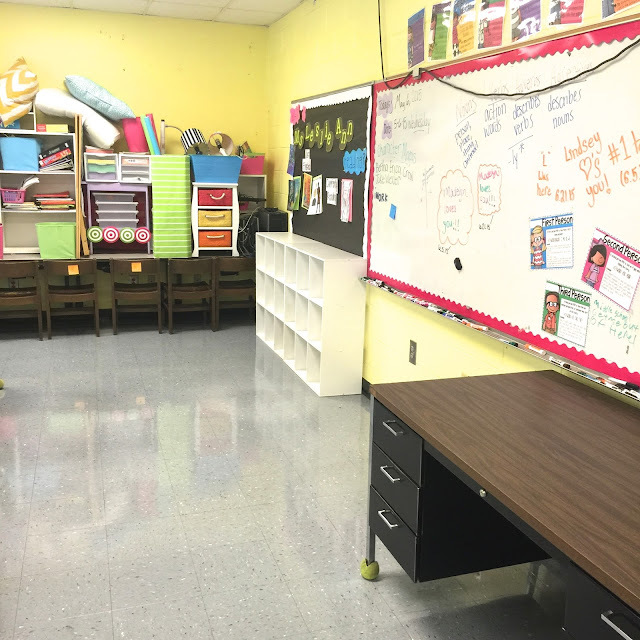 I love decorating and organizing my classroom in the summer! You are inspiring me to get started very soon! We only have a few days to prep our rooms before school starts. If I could go back now, I would! Unfortunately we are not allowed to work in our classrooms during the summer. We are allowed one day before teachers report. I am usually stressed out that I will not get it all done. 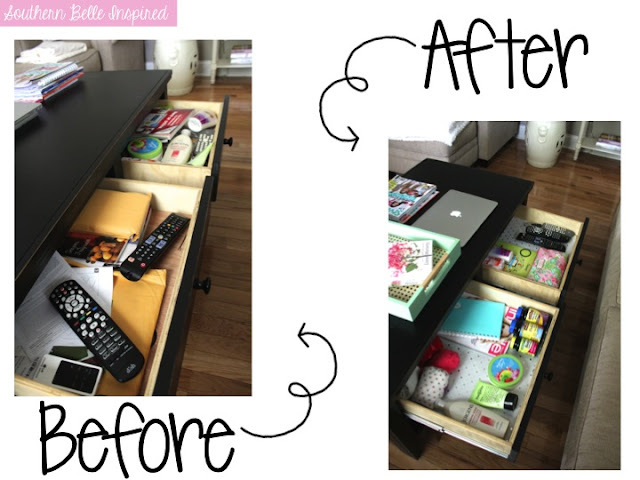 Decorating/organizing always looks worse before it looks better, right? I just finished day 2 in my classroom yesterday and although I got a lot done, it looks like an organized mess! Our colors are so similar! I've always had blues and greens. A few years ago I added pink, which really brightened things up. This year I'll still have some pink, but I am trying to tone it down some with black and white. I also have a black and white rug with white bookshelves. I think black or white bookshelves would work! I love going in to decorate when the school is empty! otherwise you are interrupted too much! Organizing during the summer is always such hard work. It looks like you have a great start on things. I look forward to seeing your boards and the rest of the room. FYI: I painted my white bookshelves black a couple of years ago. I put black butcher paper down on the floor under each one. Then used totally black paint with primer and a roller. It takes 2 coats and costs about $30. So much less expensive than buying new shelves. If you want to do this, you should knock it out in July. I did mine 2 weeks before school started. 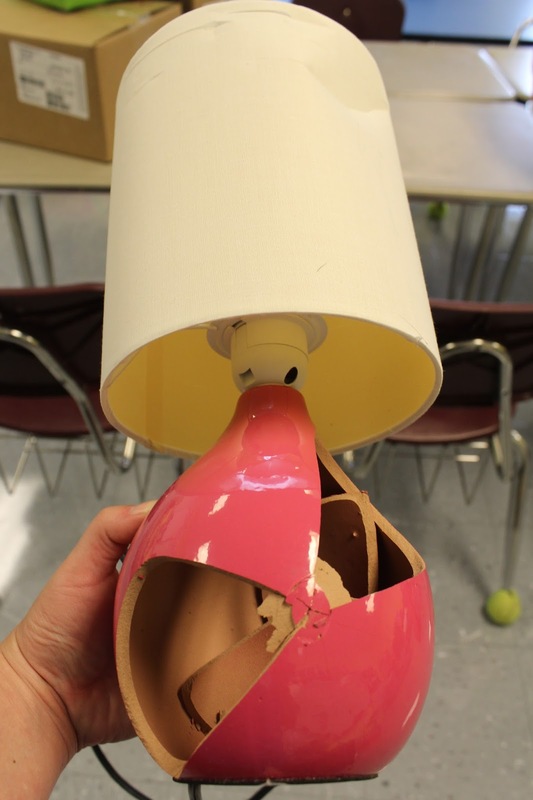 The paint was dry, but not really hardened enough. Probably because of the fluctuating temperature in the building. I'm going to a new school this year. All my stuff is home in living room. Ugh! My new school is under renovations so I'm not sure when we will be allowed to get it. I'm sure I'll be there late getting it done. We are not allowed back into our classrooms early. I have moved classrooms several times (within the same school). This year, I will be staying in the same room! (So excited!) I left up most of my boards and just covered them with paper. I am a little disappointed that I will be unable to "redecorate" my room, but with the stress of only having a couple of days before open house, I know that I will be glad that it is already done when I return.